The Race continues as teams depart from the Hotel del Coronado before midnight. They must drive back up the coast and find Urban Light in Los Angeles. 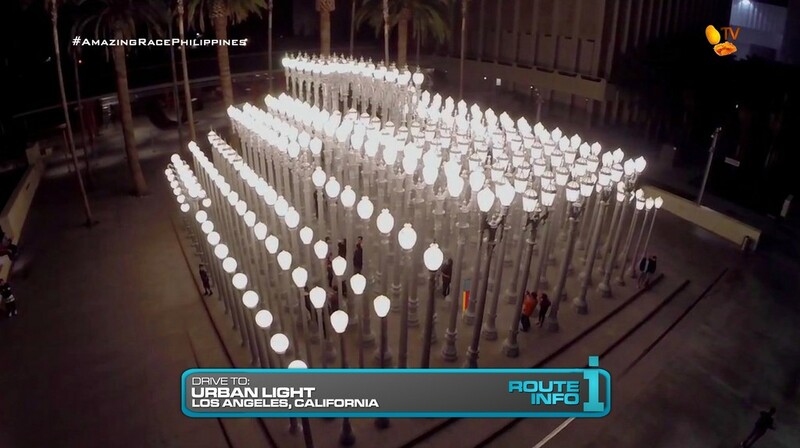 Teams must figure out this is a popular art installation in front of the Los Angeles County Museum of Art and their clue is waiting amongst the 202 lamp posts. 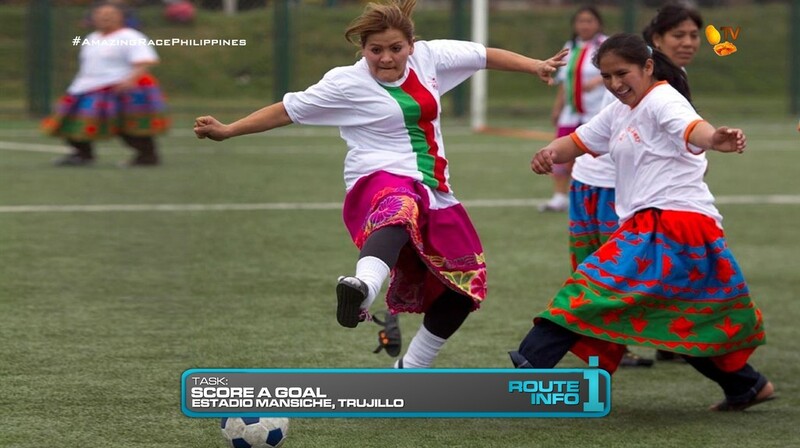 That clue tells teams they will now be flying out of LAX to Trujillo in Peru! All teams will be on the same LAN Airlines flight from LAX to Lima arriving at 12:10am. But there are two flights from Lima to Trujillo: LAN Airlines arriving at 6:40am and Avianca arriving at 7:34am. Once in Trujillo, teams must take a taxi to Plaza de Armas for their next clue. 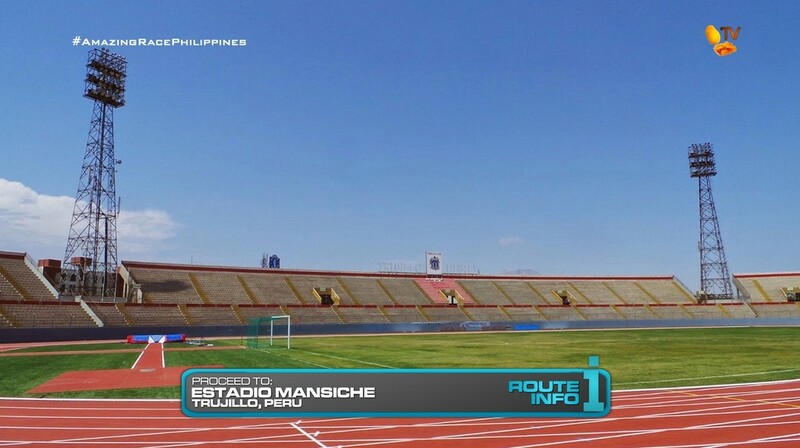 Teams will now make their way to the Estadio Mansiche. And here, teams will find a Double Yield! Teams with Super Yields may use their reward here. 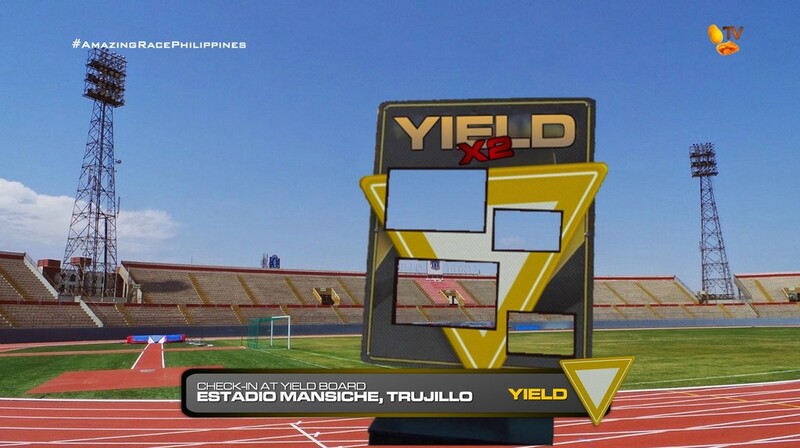 After checking in at the Yield board, teams must now face off against a local soccer team. Each team member must pass a soccer ball to each twice before shooting at the net and scoring a goal. Once they’ve scored, they will be given the next clue. 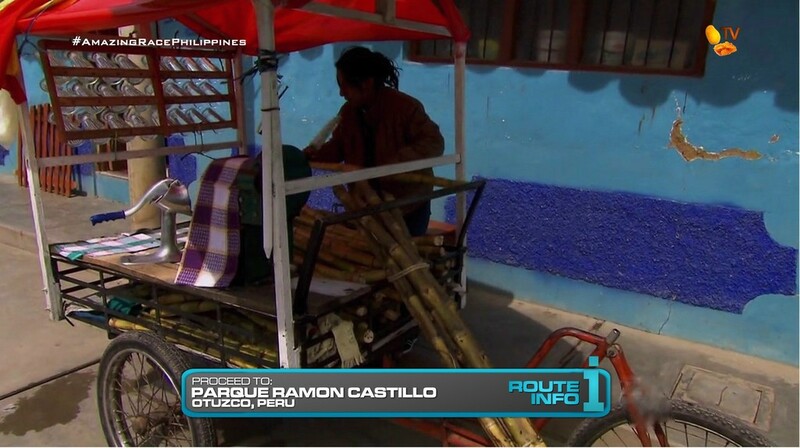 Teams can now take a taxi toward Santo Domingo then Fundo San Fernando, Cuartel #1. Here, teams will find the Road Block: Who’s feeling a little sweet? 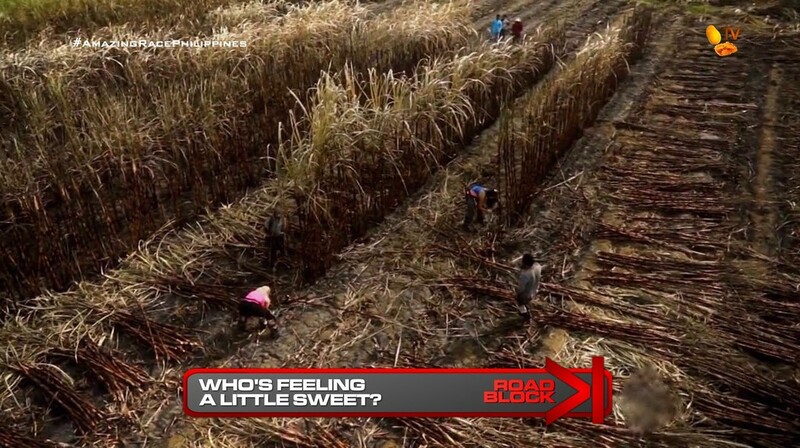 For this Road Block, teams must chop down and harvest one row of sugarcane. 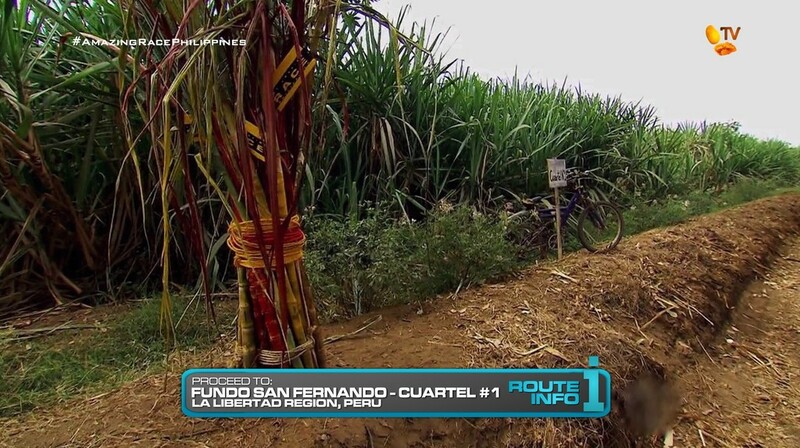 Once they have completed the Road Block, they will be given a bundle of sugarcane which they must now deliver to Parque Ramon Castillo in Otuzco. Teams will now drink freshly pressed sugarcane juice from the bundle they will have delivered to receive the next clue. And now teams face the Detour: Mamas or Papas. 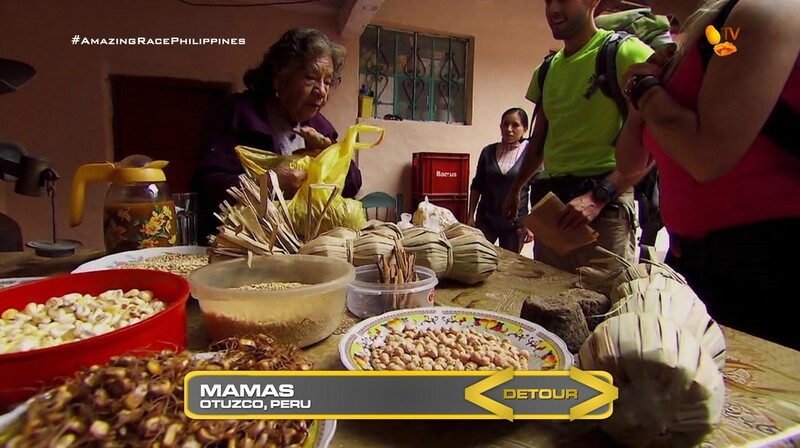 In Mamas, teams must walk through the Otuzco Market and find five different shops where they will purchase nine ingredients for Peruvian moonshine brew from a provided recipe. They will then deliver the ingredients to Mama Mecha, a lady known as La Senora de la Chica, and purveyor of the best moonshine who will give them the next clue. In Papas, teams will head to a potato farm and sort a pile of potatoes into separate sacks by type. They will then be taken by motor taxi to one of the marked stands in the Otuzco Market where they will place each variety of potato in their own bin. Once they’ve correctly sorted the papas, they’ll get the next clue. But if they incorrect, the potatoes will be released from the bins and will fall to the ground. After completing the Detour, teams can make their way on foot to find Virgen de la Puerta. 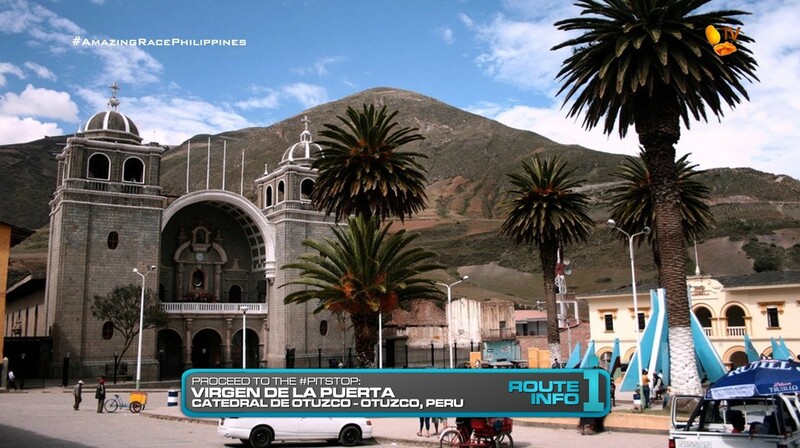 The image of this Catholic Marian devotion in Peru is housed at the Otuzco Cathedral, the Pit Stop for this Leg of the Race. This was one of TAR26’s very best Legs. (They didn’t have many.) So this would be a good recycled Leg for TARPH. It gets teams into South America and here specifically, will provide some beautiful scenery. And more than half of it is a rural Leg, which every season should have at least one. There are some modifications to the full Leg of course. First, teams will be driving back up to Los Angeles to make it easier to fly out of LAX. Plus, being in the United States, why not sulit or take full advantage of the opportunity. The Urban Light installation should look great in the early morning hours, all lit up in the dark. Driving at midnight will also eliminate the traffic problem which doesn’t need to happen in this Leg. 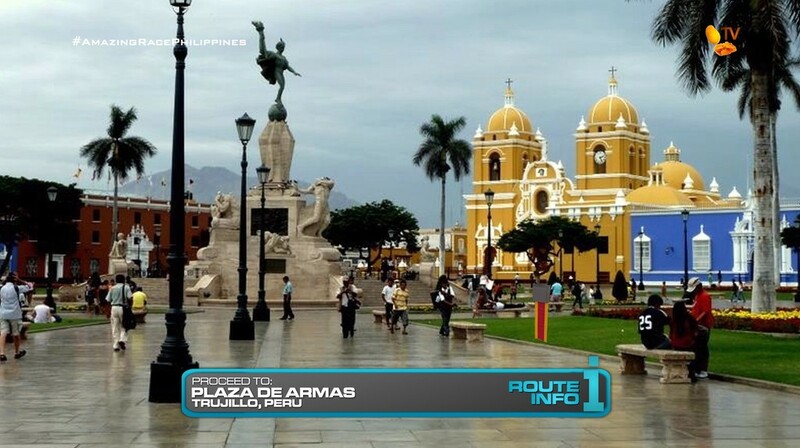 Plaza de Armas is a no-brainer Route Marker location. But instead of the shoeshine Route Marker from TAR26, I added this soccer task since it would be good to have at least one extra task in Trujillo. Plus both TAR Canada and TAR China had soccer tasks this season. The Road Block and Detour from the TAR26 Leg were great. So no changes to them here. The sugarcane delivery and drinking is just a simple, extra task. And the Pit Stop at the Cathedral plaza is fine as well. I included the Yield here because the Super Yield reward would have no use if there weren’t more than a few opportunities to use it. Plus, I would never put a U-Turn at the end of the Leg unless it was a Non-Elimination. Overall, like TAR26, this should be a great Leg. Especially with more than five teams. ← Recap: Shuriken Sentai Ninninger, Episode 29 – Ninja Board Game – Definitive Edition!